If you’re about to craft a perfectly balanced diet, these 20 baked chicken breast recipes of today might be the salutary choices in your menu rotation. With the average consumption of 92 pounds per person in the year 2017, chicken is a nutritionally-dense choice of dieting – and we surely don’t need to spin a further discussion on this any longer. But there’s an even more splendid way to plan your meals worry-free, that is going for chicken breast. It’s the versatility and leanness of white breast that brought it to be in high demand in the US for decades. The excellent source of protein from chicken breast surely is a welcome agent to support your weight-loss plan and also your overall health. You may have experienced dry and tough, or juicy and tender chicken breasts before, you may gag or gush towards the meat. No matter how polarising people’s impressions towards chicken are, we can still declare its health benefits in preserving metabolism, maintaining muscle mass and being a fantastic diet supporter. Chicken breast is a wonderful source of lean protein that’s low in saturated fat and calories. Limiting saturated fat intake is one efficient way to lower cholesterol level in your blood, and as a result, reduce heart disease and stroke. But that’s not the whole story yet. Because how chicken breast is prepared may result in very different outcomes. *Please be noted that these following indices on nutritious contents should be applicable to a 3.5-oz serving of a boneless, skinless chicken breast cutlet. Data owned to The USDA. Within the above mentioned sample size of chicken breast, there are zero grams of carbs, 2.6 grams fat (2% daily value; followed with 0.6 grams saturated fat), 64 milligrams cholesterol, 116 milligrams sodium (3% daily value) and an impressive glycemic load of less than 15. Chicken breast is also rich in selenium, phosphorus and B vitamins. A single portion of raw chicken breast retains 2.6 grams fat (2% daily value; followed with 1-1.5 grams saturated fat). Cooked chicken breast is another story though, where the fat content will most likely increase to 3.6 grams. This number will be 7.8 grams for skin-on and bone-in cutlets. The saturated fat also drives up at the same race. Dietary protein is probably what gets people hooked to chicken breasts. Shedding a few pounds will no longer remain a S+ level mission once you add more protein to your diet. You can find up to 21.2 grams protein within a raw chicken breast cutlet, and the good news is, you’ll also get all 9 types of beneficial amino acids, including those that cannot be synthesized by human body and must only be obtained through diets only. To represent some of them: tryptophan to assist with easing anxiety; isoleucine and its effects on quick wound healing and blood sugar stabilization; threonine with improvements on immune system and cardiovascular system. Protein helps you boost satiety and body’s energy expenditure. By consuming a “complete protein” like chicken breast, you’ll more likely feel full longer from fewer calories, while your body, synchronously, also burns extra calories. With 1 milligram per raw serving, iron supports the body to metabolize protein and produce hemoglobin and red blood cells. Simultaneously, zinc works mainly at producing hormones and improving immunity, and is also one of the best anti-inflammatory agents. How many calories are in a cooked chicken breast cutlet? Not only is it a “complete protein”, chicken breast also delivers you with just 165 calories per the said serving, which means consuming chicken breasts will promise you higher chances of reaching your weight-loss goal. Other different parts of the chicken like drumsticks, thighs or wings are all higher in calories and fat when compared to breasts. And surprisingly, the higher calories it is, the lower protein they retain. Skin-on chicken wings are the fattiest (with 19.5 grams fat), while drumsticks are the part with highest sodium content (with 95 milligrams each for skinless ones). How cooking method and add-ups can lead to big differences? For chicken breasts, I believe it’s best to stick to the KISS principle – keep it simple, salubrious. Sounds weird, but makes perfect sense. That is, if you wish to round things out in minutes and not sweat yourself to death only for a meal. Baked chicken breast is considered low in fat and calories, but if you don’t prefer having it alone, think twice before adding in any other ingredients. Sauces and dippings will surely increase the sodium content, while melted butter and cheese drives the saturated fat up. Herbs, spices and natural oils are the most preferable seasonings. 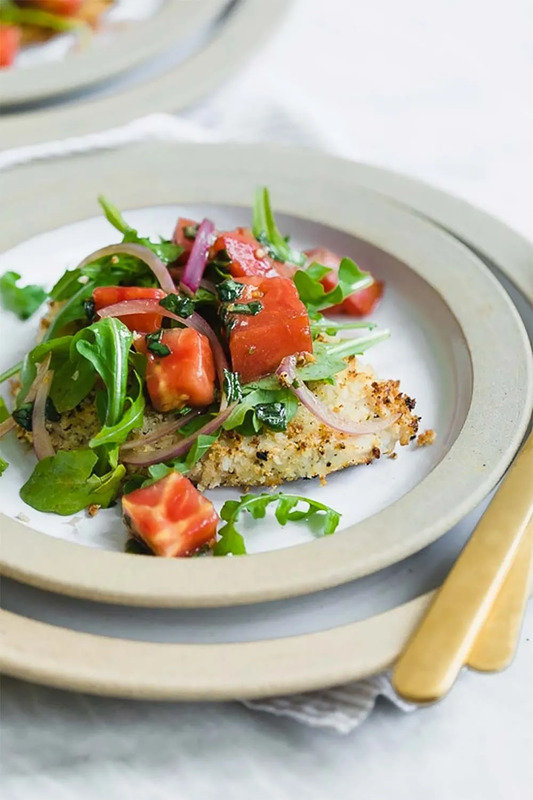 Baked Chicken Milanese with arugula and tomatoes may sound so fantasia, but once you have figured out how to pull this thing off, you’ll be amazed at how a simple combination of foods can be both appetizing and nutritious at the same time. I’m pretty sure that this dish is just like any Milanese dish you’ve come to acknowledge before, but is somehow a leaner version, thanks to the whole wheat, Italian-seasoned breadcrumbs as a crispy coating. As exquisite as it looks, baked Milanese chicken can actually save you in a pinch every time you’ve run out of dinner ideas. It’s like a salad with chicken breast meat baked and topped with arugula, tomatoes, and that’s it. Feel free to sprinkle some grated cheese to make it a bit more cheaty of a healthy treat if you wish to. 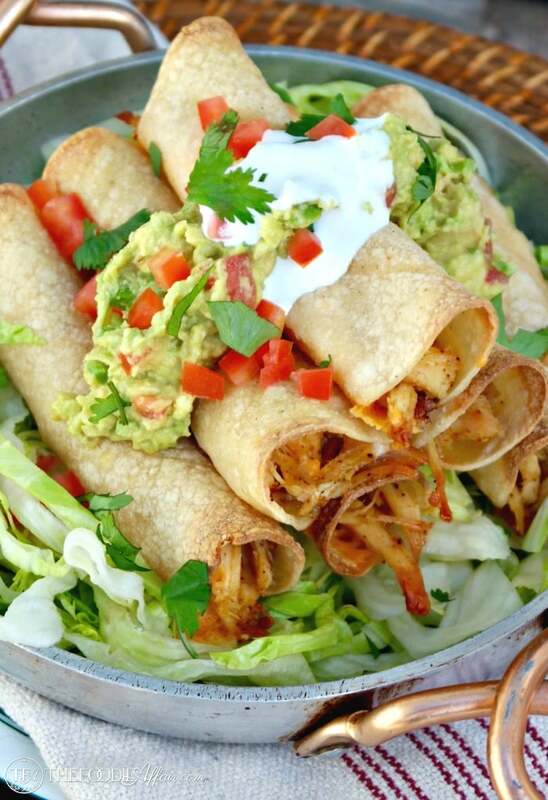 Rolled in corn tortillas, baked chicken taquitos promises you a healthy staple that comes in just minutes, with much less oil and grease than those fried versions of taquitos at Costco. The possibilities for toppings also spread wide, from avocado dip, salsa to Mexican crema and Pico de Gallo – so much in just one chicken roll dish. Whether you wish to give yourself a fiesta alone, or are seeking a quick solution for festive outdoor gatherings, there’s no way you could go wrong with this Baked Chicken Taquitos. Get ready to settle yourself right in. Okay so I see that you might get a bit confused here. I brought this recipe to the list genuinely because I myself once made it with breasts and not thighs (have I mentioned how obsessed I am with chicken breasts?). Anywayyy, it came out heavenly. I had never before imagined how chicken meat could go with mustard. Mustard, in most cases, is a bit too… oppressive to me. But this honey Dijon garlic chicken successfully proved me wrong. The exotic aroma of the dish acknowledges a big support from the sautéed garlic in honey Dijon sauce. The amazing collaboration between the sweetness from honey and the nuance from the mustard in perfect ratio is just beyond words. It’s a super balanced skillet-grilled staple. Alright I know what you’re thinking. Yes, I did break this list’s rule for the second time in a row, and that’s just for one single dish. But honestly, there can hardly be any wrong move while enhancing the taste if you put the chicken cutlets to bake instead of pan-frying them on the heat. It’s festive the same either way. Skillet-grilling brings an outdoor picnic atmosphere, while oven-baking simply helps you round things out in a blink. It’s one-pan, and so comfortable for family nights. Trust me, you’ll regret none. Juicy and savory, these pan-roasted honey chicken thighs can pile over anything, and with whatever side you want. The golden-brown hue sauce made by caramelizing on the heat appears as a true burst of flavor for any of your family reunions. The sweetness from honey with the pungent aroma from sautéed garlic are just out of this world. Some extra veggie chunks to neutralize the sweet and the buttery aroma of chicken, or a hot bowl of fried rice will be perfect matches. This is an entrée for a family of 4 that lasts for a whole week long and costs you only 4 ingredients and 45 minutes to throw in together. Oh how crazy that sounds. But I’m totally not telling fibs. With fresh pesto, mozzarella slices and ripened tomatoes gathered together on top of the juicy chicken breasts, pesto chicken bake is truly that savior to make you stop asking yourself every dinner time: “What am I doing here in the kitchen?”. Oh yeah, tell me something I don’t know. Capable of being made ahead of time and also reheated within 5 minutes, this dish is just perfectly perfect for any starving family that’s in rush all day every day. I don’t find any other words that are more fitting for this dish than “basic and straightforward”. This chicken Alfredo baked ziti is plain nostalgic and absolutely no age-discriminated. Pretty sure you did, at least once, dive in it or something of similar to it when you were 5. Now, if there’s any chance to bring this dish back, the best bet is that you will still do the same; despite the fact that you’re old enough to pay bills on your own now instead of nagging your mom during grocery trips like before. The ingredients are simply things that you can pronounce. All you need to do is to layer them in a sheet, one by one, and bake them uncovered until they’re well coalesced into each other. Plus, the options for pasta are unlimited. Your ziti preference can vary in all shapes, sizes and wheats – whatever, as long as it could warm you up. Oh and don’t forget parsley as the final sprinkle too. As you can tell right from the pictures, this teriyaki chicken casserole is probably one of the greenest casserole to ever come to your credit. It can be accompanied with a simple creamy sauce or soup mix – just chicken, veggies and brown rice. This dish truly deserves happy raves everywhere it sets its feet on. Teriyaki chicken casserole perfectly makes it a forgiving staple standard that will not make you go nuts, but instead, feel renewed all over from the inside out. Know what can keep your tastebuds pampered? Roasted chicken breast strips, and a salad. Here we are, another one-pan recipe. Bet you wouldn’t know how much I’m into dishes that raise no difficulties for me in cleaning afterwards. Not to mention how low-carb, gluten-free it is, but still juicy and savory at the same time with no heavy cream at all! Supported by hints of garlic, parsley, dried thyme and dried rosemary, this creamy herb chicken can pair perfectly over rice, pasta or mashed potatoes. Also, try cashew milk or almond milk if you wish to go completely dairy-free. Including Panko breadcrumbs for a crispy golden-brown coating, Ranch seasoning, and shredded sharp cheddar cheese for the toppings, this Ranch cheddar chicken honestly lends me that exact good-bad-boy thrill. It bares a super regular outer look, but is actually a bomb, bursting in flavor. The name ‘Monterey chicken’ is drawn from its 2 most important ingredients – Monterey Jack cheese and boneless chicken breast. This dish delivers an intimate smoky flavor thanks to the BBQ sauce brushed all over on top. This dish is not only pleasing to the eye, but literally pulls it off at any get-together you’re about to have. The juicy chicken meat is covered in melted Monterey cheese and a mixture of honey and soy sauce, together with tomatoes, green onions and crumbled bacon on top. Also, don’t forget to pair it with Mexican rice and seasoned black beans to achieve a perfectly salty but sweet combo. To put it in the nutshell – this recipe involves 2 things, baking the chicken breasts, then adding herb toppings. That also explains how it came to be an ultimate time-saving dish for you. You can both bake the chicken breast and whip the Bruschetta topping up the night before, and the next day you’ll only have to spend 5 minutes to have everything sniffling hot on demand. This Italian herb Bruschetta chicken also tastes (and probably smells) so festive and christmassy that you’ll be dazed at the fact that it’s here to support your diet! “But there’s a glaze.” you might say. Clearly, the term ‘glaze’ has always been, more than once, mistaken with some glossy-sugar-infused-anything. But balsamic glaze is actually thickened without any sucrose. I know, a weird-enough TIL for me too. Of course, a pinch of brown sugar cannot do any harm either, if you desire. The golden, crispy-on-the-outside and super-tender-on-the-inside fillets in this Chicken piccata will always takes the cake on your family table everytime. Just give it a chance with pasta or mashed potatoes and you name it. Don’t forget some extra shots of Pinos Gris if you wish to bring it to fancy guest treats. A grandstander that’s glazed in a unique lemony, buttery sauce it is. If chicken breast meat always appear too bland to you in taste, the sad news is that you might (for sure) have done it the wrong way all these years. This artichoke chicken recipe will show you how to amp up the flavor and the juiciness of baked chicken breasts with only Italian dressing and artichoke mixture. This dish can just match perfectly with any side you can grab within your 4 kitchen walls. Tear them apart, add some asparagus and spinach and call it a salad. Rice or pasta? Ottimo! Involving one sautée and two bakes, this copycat alice springs chicken may sound a bit intricate to you at the first place. But once getting to know how figure-friendly and flavor bursting it is in every bite, you’re going to regret not trying it sooner! Moreover, this recipe serves you 2 kinds of meat in 1, so don’t be startled at the crispy bacon crumbs coming together with the bubbly gooey cheese and earthy mushrooms. I don’t know about you, but I can literally taste the addictive creamy, pungent garlic parmesan sauce on juicy, tender chicken breast cutlets just by reading the name. The recipe goes for the easiest choice of starch as a sauce’s thickness agent – flour. The chicken meat is also topped with small tender potato chunks to serve. Additional options for toppings are rice, pasta, quinoa, couscous or wild rice. If you wish to add extra veggies and hope to reach your desired crunchiness, simply throw them in just when the chicken is almost cooked through. This chicken and potatoes with garlic parmesan cream sauce is homemade, convenient for a simple weeknight dinner and satisfying with bursts of flavors. What a belly-warming choice to get yourself soaked in after a long, weary day. Served in pita breads and sometimes wrapped with heaps of veggies, this Middle Eastern Chicken Shawarma dish is an all-time favourite street food that will surely give you the chills each and every Friday weeknight meal. There is even a possibility for a shawarma chicken salad sandwich as a spin-off, all you need to do is get a couple of sandwiches toasted and some (read: a lot) of spinach – if that somehow makes you feel any healthier. Finally, some zesty drizzles of tzatziki sauce over the veggie chunks will be just breezing to call it a day. So I guess you may have already imagined how to throw this brown sugar spiced baked chicken together just by looking at the pictures. I mean, can it be any more obvious? Chicken breasts, coated in some brown sugar mixture, no? Okay, the mixture is actually brown sugar, paprika, oregano, garlic powder, salt, and pepper altogether. The broccoli is baked together with the chicken until crispy in the very same amount of time and temperature. That means you’ll have everything ready on only one pan at the same time, including the entrée and the side dish! How terrific and convenient is that. Here comes the most elegant one on the list. Okay, to me, at least. Filling, comforting and all cheesed up, this chicken stuffed with ricotta cheese and spinach promises you a veritable holiday food feast in just under an hour. This dish is easy and delicious but at the same time, also lends off a beautiful presentation. Simply double it up if you’re about to have big company coming over. It’s just that basic kind of recipe that people will likely leave a bookmark in their recipe books. Finally, buttered noodles or spaghetti with extra marinara sauce will make it a perfect accompaniment when brought to serve. Another quick, incredible Italian treat it is. Topped with generous dollops of cheese and tomato sauce, this baked Ricotta chicken involves both browning the chicken breasts on the skillet and baking them over high heat so they’re both tender and juicy with a nice kick of melted cheese. This dish is surely born to serve with pasta, especially when nicely seasoned with the Italian dressing mix and white wine vinegar. Thank you for including my Chicken Stuffed with Ricotta Cheese recipe!